Anand is the administrative centre of Anand District in the state of Gujarat, India. It is administered by Anand Municipality. It is part of the region known as Charotar, consisting of Anand and Kheda Districts. India, also known as the Republic of India, is a country in South Asia. It is the seventh largest country by area and with more than 1.3 billion people, it is the second most populous country and the most populous democracy in the world. Bounded by the Indian Ocean on the south, the Arabian Sea on the southwest, and the Bay of Bengal on the southeast, it shares land borders with Pakistan to the west; China, Nepal, and Bhutan to the northeast; and Bangladesh and Myanmar to the east. In the Indian Ocean, India is in the vicinity of Sri Lanka and the Maldives, while its Andaman and Nicobar Islands share a maritime border with Thailand and Indonesia. A screenplay writer, scriptwriter or scenarist, is a writer who practices the craft of screenwriting, writing screenplays on which mass media, such as films, television programs and video games, are based. My Name Is Khan is a 2010 Indian drama film directed by Karan Johar, produced by Hiroo Johar and Gauri Khan, and starring Shah Rukh Khan and Kajol in lead roles. The film was jointly produced by Dharma Productions and Red Chillies Entertainment and was distributed by FOX Star Entertainment, which had bought the rights for the film for a sum of ₹100 crore, making it the most expensive Bollywood film of 2010. It is also the highest buyover for any Indian film, surpassing Ghajini's record of ₹90 crore. The Mirchi Music Award for Album of The Year is given yearly by Radio Mirchi as a part of its annual Mirchi Music Awards for Hindi films, to recognise the best song of that year. The 3rd Mirchi Music Awards, presented by Radio Mirchi, honored the best of Hindi music from the year 2010. The ceremony was held on 27 January 2011 at the Bandra Kurla Complex, Mumbai, and was hosted by Shaan and Sonu Nigam. The program featured many performances, including those by Bappi Lahiri, Usha Uthup, DJ Lloyd, Akshay Kumar, Anushka Sharma, Rishi Kapoor and Priyanka Chopra. Several award categories were introduced for the first time, including Best Indipop Song, Best Item Number, Best Raag Inspired Song, Best song in Sufi Tradition, and Best Album of Golden Era. Dabangg won a leading eight awards including Album of the Year and Song of the Year for "Munni Badnaam". The Mirchi Music Award for Lyricist of The Year is given yearly by Radio Mirchi as a part of its annual Mirchi Music Awards for Hindi films, to recognise a lyricist who has delivered an outstanding performance in a film song. Kal Ho Naa Ho, also abbreviated as KHNH, is a 2003 Indian romantic drama film directed by Nikkhil Advani. The film features Jaya Bachchan, Shah Rukh Khan, Saif Ali Khan, and Preity Zinta as the lead characters, with Sushma Seth, Reema Lagoo, Lilette Dubey, and Delnaaz Paul in supporting roles. It narrates the story of Naina Catherine Kapur, a pessimistic and uptight MBA student. She falls in love with her neighbour Aman Mathur, a terminally-ill heart patient who tries to get Naina and her friend Rohit Patel to fall in love with each other, since he does not wish to bring her the pain of his death by reciprocating her feelings. Yash Johar was an Indian Bollywood film producer. 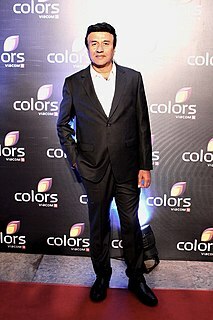 He founded Dharma Productions in 1976 and made Hindi films that were noted for featuring lavish sets and exotic locations, but upheld Indian traditions and family values. Anwar Sardar Malik, best known as Anu Malik, is an Indian music director and singer. He is an Indian National Award and Filmfare Award winning music director, who primarily composes Bollywood music for the Hindi film industry. Known as one of the mega music composers of 90s in India, he is the son of Sardar Malik. Anu Malik made his debut as a music composer in 1980 with the film Hunterwali 77. He is also the only Music Director in Bollywood to win Filmfare Special Award(For the movie Refugee). Shankar Mahadevan is an Indian singer and composer who is part of the Shankar–Ehsaan–Loy composing trio team for Indian films. Shankar–Ehsaan–Loy is an Indian musical trio consisting of Shankar Mahadevan, Ehsaan Noorani and Loy Mendonsa. They have composed music for over 50 soundtracks across five languages - Hindi, Tamil, Telugu, Marathi and English. Amongst the most critically acclaimed Indian musicians, the trio have won numerous awards, including National Film Award (India), Filmfare Awards, IIFA Awards. They are often referred to as the "Amar Akbar Anthony" of the Hindi film music industry.. The International Indian Film Academy Awards are a set of awards presented annually by the International Indian Film Academy to honour both artistic and technical excellence of professionals in Bollywood, the Hindi language film industry. Instituted in 2000, the ceremony is held in different countries around the world every year with the most recent one being held at the Siam Niramit Theatre in Bangkok, Thailand on 22-24 June 2018. Sonu Nigam is an Indian playback singer, composer, live performer, host and actor. He sings predominantly in Hindi and Kannada language films. He has also sung in English, Bengali, Manipuri, Gujarati, Tamil, Telugu, Marathi, Tulu, Assamese, Odia, Nepali, Maithili, Malayalam and various Indian languages. Nigam has also released Indian pop albums and acted in a number of films. He has been one of the highest paid Indian singers. He is often regarded as a "Modern Rafi" and is now considered as one of the most versatile singers of the Hindi film industry. He is also regarded as the "Lord of Chords". Richa Sharma is an Indian film playback singer as well a devotional singer. In 2006, she sang Bollywood's longest track, the bidaai song, in film Baabul (2006). 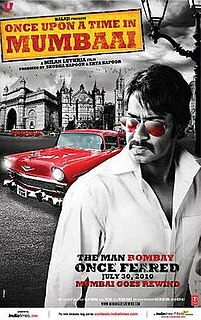 Once Upon a Time in Mumbaai is a 2010 Indian gangster film written by Rajat Arora, directed by Milan Luthria and produced by Ekta Kapoor. It stars Ajay Devgn, Emraan Hashmi, Kangana Ranaut, Prachi Desai and Randeep Hooda. The film is produced under Balaji Motion Pictures and released on 30 July 2010. Once Upon A Time in Mumbaai received generally positive reviews from critics and was a box office success. The film is loosely based on the lives of Mumbai underworld gangsters Haji Mastan and Dawood Ibrahim. Ishqiya is a 2010 Indian black comedy film starring Naseeruddin Shah, Vidya Balan, Arshad Warsi and Salman Shahid in the lead roles. It was directed by Abhishek Chaubey in his directorial debut and was produced by Raman Maroo and Vishal Bhardwaj. The film was released on 29 January 2010. Tees Maar Khan is a 2010 Indian Hindi heist comedy film directed by Farah Khan, starring Akshay Kumar, Katrina Kaif and Akshaye Khanna in the lead roles. Salman Khan and Anil Kapoor make special appearances in the film. The film was released on 24 December 2010. The film is today primarily remembered for Katrina Kaif's dance number, Sheila Ki Jawaani. The theatrical trailer and title song of the film were released on UTV Motion Pictures YouTube channel on 4 November 2010 for promotional purposes. The trailer was premiered in theatres with Vipul Shah's Action Replayy and Rohit Shetty's Golmaal 3 on 5 November 2010. The film is an official remake of the 1966 Italian film After the Fox. Delhi-6 is the soundtrack album to Rakeysh Omprakash Mehra's 2009 film of the same name. A. R. Rahman scored the film, his second collaboration with Mehra after Rang De Basanti and Prasoon Joshi penned the lyrics. The music was released on 14 January 2009 at the Indian Idol 4 competition. "Kal Ho Naa Ho" is a 2003 Hindi-language filmi song performed by Sonu Nigam for the 2003 Indian romantic drama film of the same name. The track was composed by Shankar-Ehsaan-Loy, while lyrics were written by Javed Akhtar. In a pathos version, Nigam is joined by Alka Yagnik and Richa Sharma. Kal Ho Naa Ho was directed by Nikhil Advani and written by Karan Johar; the latter co-produced it with his father Yash Johar under the banner of Dharma Productions. The music video of "Kal Ho Naa Ho" features leads Shah Rukh Khan, Saif Ali Khan, and Preity Zinta; the former sings about life's unpredictability and wistfully watches the others romance. "Tere Mast Mast Do Nain" is a song from the bollywood film Dabangg starring Salman Khan and Sonakshi Sinha, directed by Abhinav Kashyap. Kausar Munir is an Indian lyricist and screen writer in Bollywood. ↑ "rediff.com, Movies: 'K3G is the biggest film ever made'". Rediff.com. Retrieved 2011-09-22. ↑ Olivera, Roshni (23 June 2014). "Lyricist Niranjan Iyengar to delve into star lives". Times of India. Retrieved 7 August 2018. ↑ "Nominees - Mirchi Music Award Hindi 2010". 2011-01-30. Retrieved 2018-09-30. This biographical article related to film in India is a stub. You can help Wikipedia by expanding it.